It sounds like Graham Nash is looking ahead to his next project. 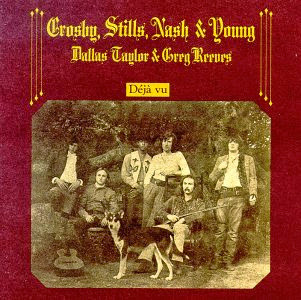 Rolling Stone reports that Nash is considering a re-master of the classic CSNY album 'Deja Vu'. Sort of like all over again. "When we made the album we were restricted by the technicalities of how many minutes you can get onto a side of vinyl without having to compress everything. It meant we had to fade everything out." "We recently did a mix of one of David's songs that went all the way through from beginning to end," he says. "I thought to myself, 'I'd like to hear 'Carry On' without it fading.' I want it to go all the way to the end when Dallas [Taylor] put his drumsticks down. I want to hear the jam we did at the end of 'Everybody I Love You.' I might talk to the boys about doing the entire Deja Vu without fading any of the songs." Graham also discusses unreleased concert footage of Crosby, Stills, Nash and Young's Fillmore East 1970 shows that were filmed. Yeah I hate old albums where you can tell every song is cut short. Jimi's first album is the worst... just when he starts jamming it fades out. It's like his record company hated his playing or something. It would have made such a great double album if every song was twice as long. The fade out is one of the worst things about recorded music. Obviously it has been used sometimes as a worthwhile effect in itself but it really is the pits when a great performance just heads into the black. Made me re think this whole album. this has always been & will always be my fave csny recording. I have an original pressing on vinyl. I have always appreciated the raw live feeling "on almost cut my hair" from the excellent csn(y) box set. now I understand why. the two works will still sit side by side, like patience & fortitude, proudly in my collection and I await, with much greater anticipation, a graham Nash re working. It is truly a classic album that deserves the deluxe treatment. Back when the 1991 CSN box came out, Graham expressed the same desire to do an expanded Deja Vu. Even then he said that it would have to get past Neil, so I imagine that's still the case now. The harmonies are stunning. (from Stills box set).